The two leaders of North Korea and the USA held a landmark summit in Singapore in June 2018.That meeting produced a vague statement in which Kim and Trump outlined four commitments without an exact timeline: establishing "new relations" for peace and prosperity; building a "lasting and stable peace regime on the Korean Peninsula"; working "towards denuclearisation"; and recovering and repatriating the remains of soldiers killed during the 1950-1953 Korean War. Good vibes continued between the USA and the DPRK throughout the summit convened in Hanoi, Vietnam -- after 261 days of the first meeting in Singapore -- in the last two days of February. The usually reclusive North Korean leader Kim Jong Un, to the surprise of the media even showed signs of opening up. Responding directly to questions from American journalists, he exemplified this through a response that if he was not willing to denuclearise, "I wouldn't be here right now." Heady talks abounded that a peace declaration was a real possibility, putting US and North Korea on a path toward finally ending the Korean War, which is approaching its seventh decade. Then, suddenly, it was all for naught. The second day of the summit was cut short, and the two leaders left with nothing to show for it. Analysts are observing that the failure to reach an agreement reflects poorly on both leaders. Some are suggesting that the implications of the failure loom larger for the North Korean leader. North Korea and the United States have offered competing narratives about why the talks fell through. North Korean Foreign Minister Ri Yong Ho, in a press conference of his own, has mentioned that North Korea had offered a "realistic proposal" -- offering verified dismantlement of Yongbyon in exchange for a "partial lifting" of five of the 11 sanctions that have been imposed by the United Nations in "areas that hamper civilian economy and people's lives." Ri Yong Ho also pointed out that "during the meeting, the United States insisted that we should take one more step besides the dismantlement of nuclear facilities in the Yongbyon area. Therefore, it became crystal clear that the United States was not ready to accept our proposal." It would appear that the UN sanctions that North Korea wanted to lift might not have been the whole suite of the sanctions against it. However, they appear to have been referring to a significant range of economic activities including importation of petroleum. Although North Korea qualified its request as lifting sanctions only in "areas that hamper people's lives," this aspect may have been enough to cause Trump perceive the request as "basically" lifting the sanctions "in their entirety." One has to note that at this point Trump appeared very subtle. This was evident from Trump's comment made in front of the media, "We brought many, many points up that I think they were surprised that we knew," and referred to another nuclear fuel enrichment site in North Korea in addition to Yongbyon. This might have related to the "one additional measure" that North Korea found unpalatable and subsequently pushed the summit to an impasse. The media has also reported US officials saying that the North Koreans would not define exactly what they meant by the Yongbyon complex. The US is believed to have asked North Korea to include within the equation other hitherto unpublished nuclear facilities. The two sides could not also agree on what were the connotations of denuclearisation. 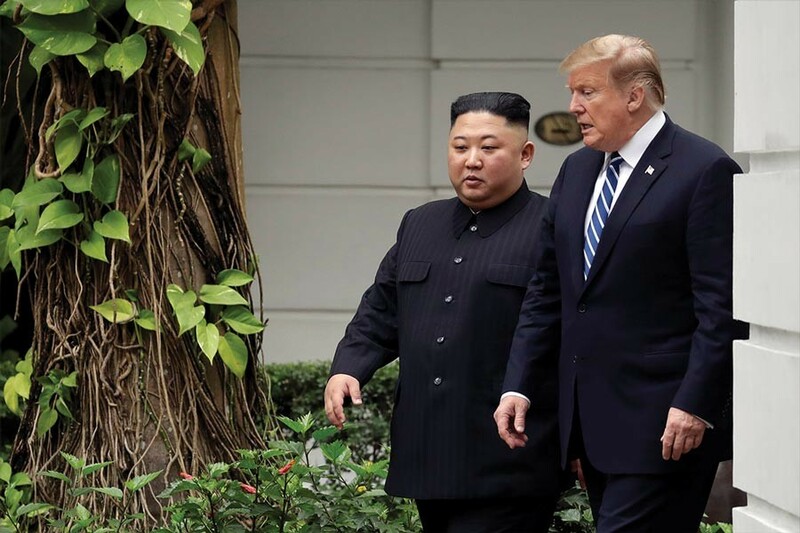 US officials have mentioned that they were being offered an end to testing and partial destruction of facilities but that left North Korea's existing nuclear arsenal intact. Another contentious point included the network of facilities that extends beyond Yongbyon. In this regard, one has to also refer to a comment made recently by Stephen Biegun, the US State Department special representative for North Korea. He said that Pyongyang had committed in pre-summit talks to destroy the entire nation's plutonium and uranium-enrichment facilities, dependent on unspecified US measures in return. It may be recalled that earlier Secretary of State Mike Pompeo had said that they had cleared away what he called "a lot of the brush" in the weeks of pre-summit talks, but there still remained gaps between the two sides they had hoped to close when the two leaders were in the same room. That unfortunately did not happen. Trump also made some other interesting observations. He pointed out that North Korea was "willing to denuclearise but we couldn't give up all the sanctions for that. He has a certain vision and it's not exactly our vision" Trump said. However, he also pointed out, "We are a lot closer than we were a year ago. Eventually, we will get there but on this particular visit, we decided we had to walk". Trump added that the two days of talks had advanced ongoing negotiations on denuclearisation and relations between the two countries. In that context he mentioned, "We want to keep that relationship. He promised me he isn't going to test rockets and nuclear missiles. I trust him and take his word for it. I hope it's true." Trump added further, "It just wasn't appropriate to sign an agreement today. We had the papers read but I just didn't think it was appropriate." Observers have, however, pointed out that there was no indication from Trump or the White House as to whether the two leaders will meet again and when. For his part, Trump and his administration have made a delicate signal but an important shift in his approach toward North Korea's denuclearisation denotations. He has now pointed out, "Speed is not important to me" and "I'm in no rush." This indicates that Trump is finally beginning to accept what many nonproliferation experts have been saying for some time -- denuclearisation of North Korea will be a long and complex process that may last over a decade. It would be important at this juncture to refer also to the observations that had been made before the Hanoi Summit by Russia and China. Apparently, Russian Foreign Minister Sergey Lavrov had been asked by Washington for advice before the summit and Lavrov is supposed to have remarked that "there is no quick solution to the Korean Peninsula issue" and is supposed to have added that the United Nations might consider lifting some of the sanctions against Pyongyang that was hampering relations between North Korea and South Korea. China is supposed to have also urged North Korea and the US to 'meet each other halfway'. Lu Kang, spokesperson for China's Foreign Ministry had expressed hopes that talks between Trump and Kim would achieve denuclearisation and lasting peace and stability on the Korean Peninsula and in northeast Asia. After the impasse in Hanoi both these countries will remain worried. It has been a known factor that many prominent politicians from the Democrat Party of the United States have been quite cynical about Kim's prospect of normalising relations with the United States. They have in this regard been sceptical of the attempts by Trump and South Korean President Moon Jae-in to create a peace regime in the Korean Peninsula. In a meeting with South Korean legislators in February, Speaker of the House Nancy Pelosi had also openly expressed doubts over the peace process, saying Pyongyang's goal was not to denuclearise, but to weaken South Korea's military preparedness. Members of this US political party will be happy with what has happened. Several analysts from South Korea have noted that while South Korean President Moon might again step in to play the role of mediator, many South Korean officials have privately expressed their frustrations that North Korea has not been doing enough to move the diplomatic efforts forward. Nevertheless, one should not think that chances of further bilateral discussion between the USA and the DPRK have been deleted. The window of opportunity for Kim might have slightly reduced but President Trump's comments during and after the meeting suggests that it is still open. Both Trump and Secretary of State Mike Pompeo have told the media that the United States and North Korea have made progress and that they are hopeful for a further discussion. Trump has also indicated that the United States would not increase sanctions, essentially maintaining the status quo of freeze-for-freeze: this means that the United States will not impose any further sanctions, will keep the joint military drills with South Korea scaled back (as agreed to in the Singapore summit in June 2018,) and that North Korea will not test nuclear weapons or missiles. One can only hope that North Korea does not do anything globally unacceptable in the next few weeks. This will be critical for them. This will include Kim not reverting to old habits of attracting US attention by resuming nuclear and/or missile tests. This would only enhance calls for keeping North Korea in the purgatory of sanctions and isolation. Kim, on the other hand could take bold, proactive steps -- the kinds of steps that Trump and Moon have taken so far -- to show his good faith and revive the diplomatic momentum. This would eventually enable North Korean citizens to live better lives. This is the moment for him to show he meant what he said about bringing a peaceful geo-strategic paradigm in the Korean Peninsula -- both in Hanoi and in Singapore.